In 2016, APA members approved a change to the geographic structure of the Association, from eight Districts to five Regions, with a more proportionate distribution of representation. Below is the current map of APA Regions and breakdown of representation. Having trouble with below-cost reimbursements from PBMs? Can't resolve an issue and need to submit a complaint? Click here to donate to the Arkansas Pharmacy Foundation. Make a contribution now for the 2017-2018 election cycle and help make the pharmacy voice heard at the capitol. 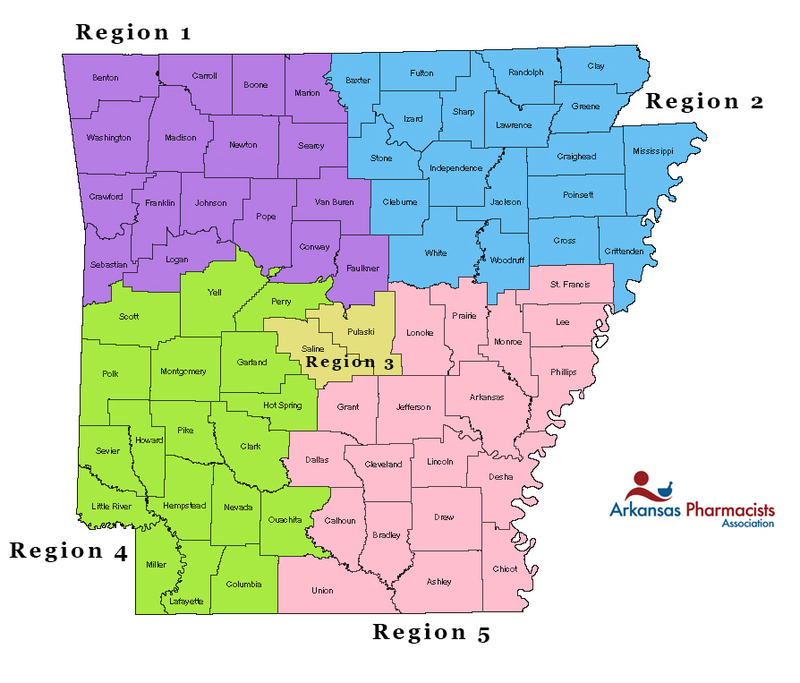 As of November 13th, changes have come to the Arkansas Prescription Drug Monitoring Program. Arkansas Department of Human Services has updated the MMIS. Click More for more information about this new system. APA and the Board of Pharmacy have developed a Naloxone Protocol. Click More to review the protocol and Act 284. Click here for important information about the federally mandated changeover to the NADAC plus true professional dispensing fee in Arkansas Medicaid. Arkansas CPESN has released its Participation Agreement.